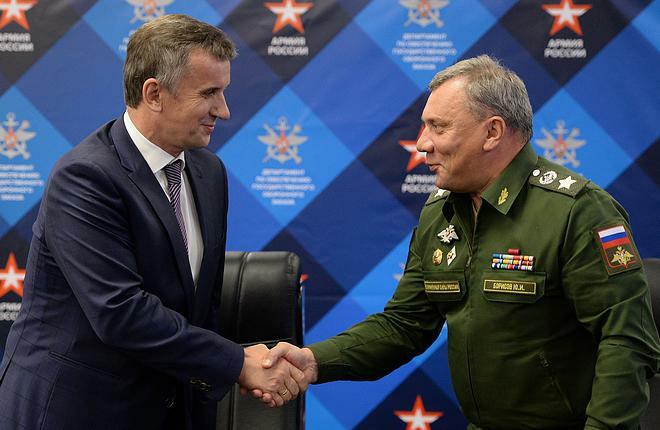 The Russian Defense Ministry has signed 17 long-term contracts with domestic enterprises at Army 2016, for a combined total of 130 billion rubles ($2 billion at the current exchange rate). In particular, the ministry contracted Zelenodolsk Gorky Shipyard to build a series of Project 21631 missile corvettes for 27 billion rubles. The contract with St. Petersburg-based Admiralty Shipyard is for six Project 636 Kilo-class submarines, to be delivered in 2019-2021. Several orders, for a total of more than 8 billion rubles, were placed with the Nizhny Tagil-based automotive manufacturer Uralvagonzavod and its subsidiaries. CEO Oleg Sienko says the biggest order went to Yekaterinburg-based Uraltransmash, which will deliver 2S19M2 Msta-SM self-propelled howitzers and upgrade the Russian military's 2S19 howitzers to 2S19M1 standard. Uralvagonzavod will provide technical support for the Defense Ministry's tanks, overhaul BMD-2K-AU armored assault vehicles, and deliver IMR-3M combat engineering vehicles. Splav Research and Production Association will deliver projectiles for Tornado-S and Smerch multiple-launch rocket systems (MLRS). Motovilikha Plants will repair BM-21 MLRS and 2S1 self-propelled howitzers, repair and upgrade 2S9/2S9-1 self-propelled mortars, and deliver 2F23 Nona-SVK mortars.